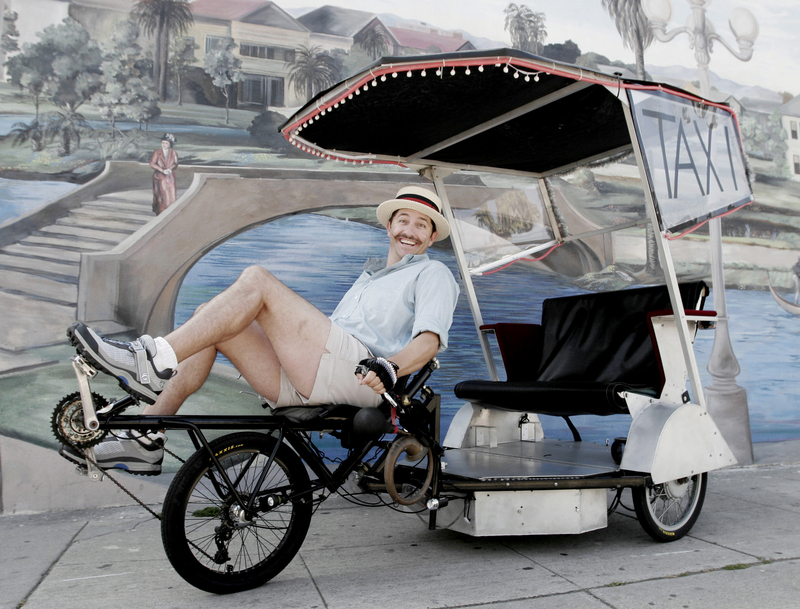 Inspired by the bamboo rickshaw on Gilligan’s Island, cyclist Reno Tondelli, Jr. not only built “the world’s first recumbent hybrid taxi,” he took the leap and turned it into a pedicab business that now supports his family. Tondelli, 43, powered up an Organic Engines recumbent trike with a 600-watt DC motor and six 12-volt AGM wheelchair batteries. To handle the extra weight, he welded new dropouts, built new wheels with fat 10-gauge spokes, and added beefy tandem hubs. He tricked it out with a stereo, aluminum fenders, and vinyl canopy, then topped it off with trickle-charging solar panels and a squeeze-bulb horn. Style points don’t count with the cops, however, and the asphalt gondolier was frequently hassled for not being street-legal. In 2008, Tondelli relocated with his wife and son to Colorado, where the solar bike is now a legitimate taxi with seatbelts, insurance, and a tractor spotlight for nighttime use. He works out of a shop shared by pedicabbers and horse-drawn carriages in downtown Denver. The film industry refugee worked 20 years in the movie biz “making stuff look cool.” Besides taking a welding class, he mostly learned just by doing it.